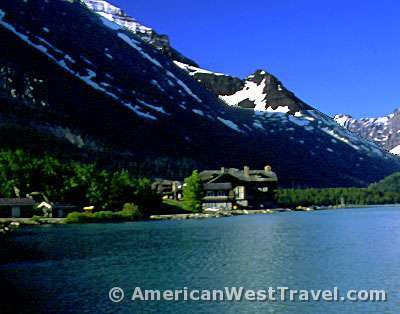 With its alpine glaciers, jagged peaks, teeming wildlife, lakes, lush forests, wildflowers, and many waterfalls, Glacier National Park is often referred to as “North America’s Crown Jewel”. 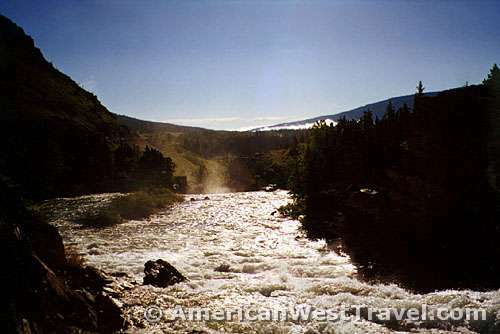 One of the Glacier National Park’s crown jewels is the fabulous Many Glacier region. 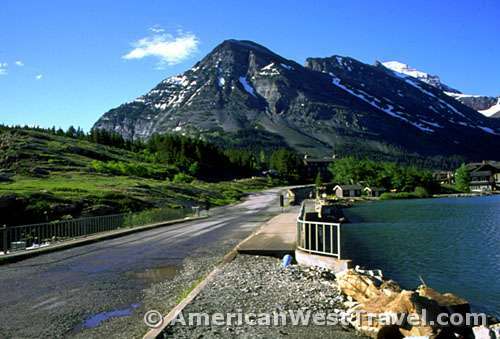 Above, Swiftcurrent Lake with its wonderful vista is the heart of the area. The classic Many Glacier Hotel is at far left. The craggy, snow covered peaks on the Continental Divide provide a spectacular background. The peak elevations in this part of the Lewis Range are about 9,500 feet. In the photo above (left to right): Mt. Allen towers above Many Glacier Hotel (the peak is not seen); left background is Mt. Gould; mountain in foreground, center is Grinnell Point; right background is Mt. Grinnell (l) and Mt. Wilbur (r). Photo, left, provides a closer view of the lodge. The photo, right, is the approach to the lodge (far right at edge of lake). Mt. Allen is barely visible behind mountain in foreground. The road goes across the dam which contains Swiftcurrent Lake. 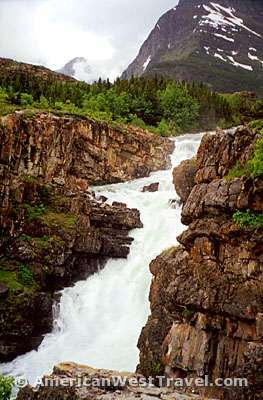 To the left of the road Swiftcurrent Creek earns its name, roaring downstream (photo, right). About a quarter mile downstream (where you can see the vapor rising), the creek drops over 100 feet in a spectacular waterfall (left). The Many Glacier Hotel, the largest in the Glacier National Park, is one of the lodges built by railroad man, James Hill, in the early 1900’s. Built in a Swiss-chalet style the central fireplace and columns in its great room have enchanted generations of visitors. The huge picture windows in the dining room overlook the lake and its vista. One evening after sunset we hiked a short distance to a nearby pond in hope of seeing some wildlife. 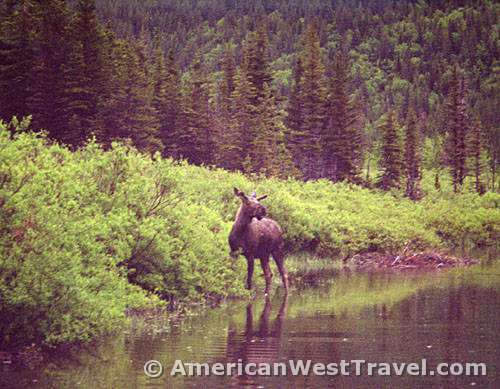 We spotted a large bull moose (right) about 100 feet from trail’s end. 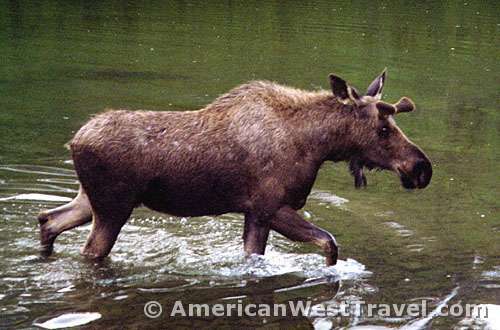 Moose generally spend a lot of time around ponds, lakes, and streams, grazing on foliage at the water’s edge. Note in the photo, the moose has already been startled by our presence. Rather than ignoring us or retreating, the moose surprisingly started trotting towards us. Perhaps foolishly, I froze and held my ground. (Gerry was a short distance behind me.) Foolish because moose have killed people and driven off grizzly bears with their front hooves. For better or worse, I felt safe because the moose was in the water, and I was on solid ground. The moose approached to within about ten feet. It paused, decided I was no threat, then turned and moved on. I shot the closeup photo left as soon as he starting moving away. Note the stubby antlers. Male members of the deer family grow new antlers each spring. 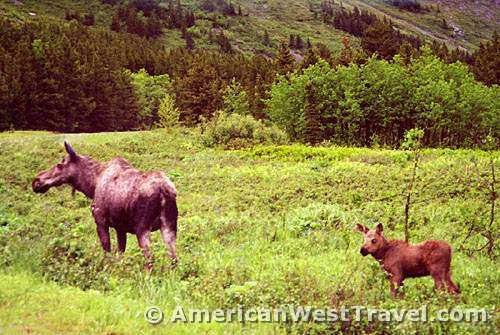 At right, a cow moose (female) and her calf graze in a meadow near the campground. This mother moose was more interested in keeping close to the cub rather than approaching people. This photo was also taken after sunset following a rainly afternoon. Wildlife sightings are very common in the Many Glacier region. We spotted big horn sheep and what appeared to be a bear high on the hillsides. 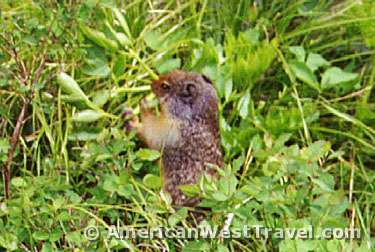 It is also common for hikers to spot these animals right on the trail. There are also mountain goats but they generally stay very high on the steep mountainsides. At left, a huge golden squirrel surveys the scenery. They are about twice the size of your typical neighborhood squirrel.